The sun has been shining and the days are getting longer and warmer. On days like these there is nothing more idyllic than lazing by a meandering river and dipping your toes in the cooling water, or soaking up the warmth on a sandy beach. The summer is always a busy time on rivers and beaches as they tend to be a focal point for a lot of people’s leisure time - they are great places to have fun, get close to nature and spend time with friends and family. This month has seen the start of our annual water quality testing at designated bathing waters across the UK. Our sampling teams will be out taking a total of 8,400 samples at over 400 bathing sites between now and September. 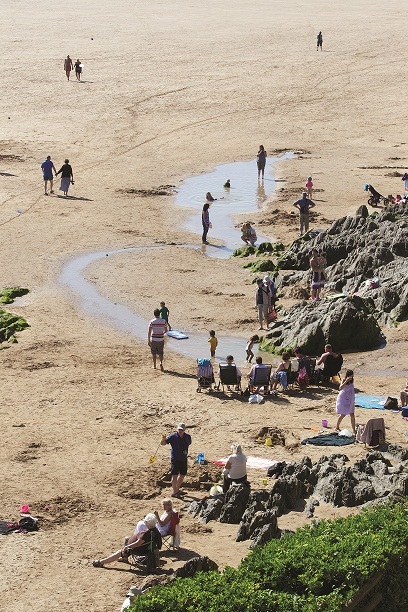 Nine out of ten English beaches are already meeting the standard, thanks to work over two decades with water companies, landowners and our staff to prevent pollution ending up in the sea. Most of these tested beaches are around our coastal line, with only a few inland beaches and lakes tested to these standards. Vigilance can save lives and water-related accidents can be avoided by knowing how to stay safe. We work hard with local communities to get the safety message out to children and parents, stressing that people stay away from the edge, that children must be accompanied by an adult and swimming should be confined to recognised bathing waters or swimming areas such as pools and lidos. We often see youngsters jumping off bridges along many of the rivers around the country and, while this can be great fun, there are hidden dangers in the water that could cause them to get into difficulties. Water can also contain hazards, particularly in and around structures such as bridges, locks and flood channels -places we would never advise people to swim, As well as dangerous tides along the coast,unexpectedly cold waters or strong currents can also catch bathers off guard.We urge parents to supervise their children closely in and around water and make sure they do not go into the water alone. We would like people to enjoy the water but to remember some basic safety points when out having fun. Don't jump or dive in as the depth may vary and there can be unseen hazards. Don't go in near weirs, locks, pipes and sluices. These and some other water features are often linked with strong currents. Inland waters can be very cold no matter how warm the weather. If you go into cold water you can get cramp and experience breathing difficulties very quickly. Always remember drowning can occur very quickly even in shallow water and the key to keeping safe is to take all necessary precautions to avoid getting into difficulty in the first place.